That's four Spire Shield Guard Posts and a Forcefield Generator all covering two anti-starship arachnid guard posts, an AI barracks, a Shield, Laser, Tractor and Vampire guardian and a Gravitic command station. At first I thought "Oh, those shields would be perfectly countered by a siege plasma starship!" - wrong. 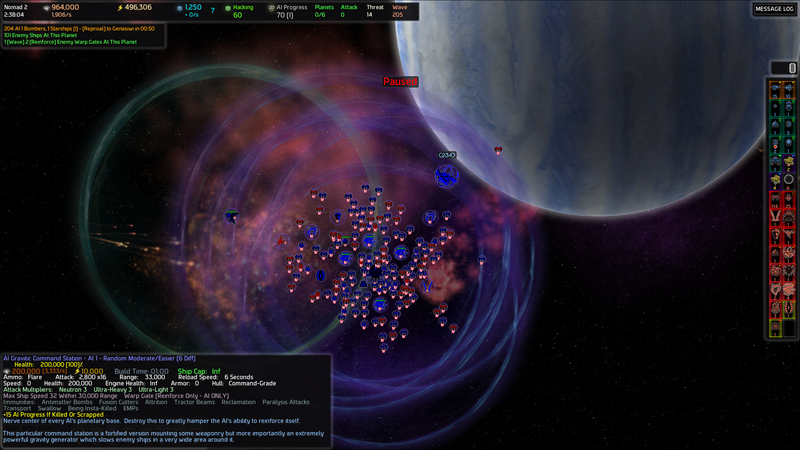 The anti-starships wrecked them in seconds, before they could even get in range, dumping a nice Level 4 reprisal wave on my face. Hm, okay, maybe these Spire Stealth Battleships I have would be better suited - they can stealth into range and then unload! Nope. As soon as they fired a shot, they were torn apart. Oops. Maybe I can just throw a blob of bombers at them? Nope. Torn apart as soon as they get in range. Maybe a cloaker starship to get the bombers in there? Nope, torn apart. Well, there's always the "Leave it alone" choice: Cloak a Raid Starship and get close enough to shoot the Warp Gate, and then just ignore the whole mess. If you don't like that, you can try the long-slow grind, using Neinzul Enclave Starships to flood the system with long-ranged chip damage. If you don't like that, or it doesn't work, you can fall back onto getting a cloaked Warhead close enough. One or two warheads should be enough to kill almost everything, leaving you with more reasonable remnants to clean up with Bombers, etc. Finally, if you absolutely MUST, you can always Nuke it. That will "solve" the problem, for certain definitions of the word. Whenever I see an obnoxious mess of shields and GPs/command station, I usually break out the Sniper Turrets(and their Radar Dampening Immunity) to chip them to death(assuming beachheading is possible). Hm, are snipers effective against shields at all? Or is this just a "Throw up some snipers and allow to ferment for four hours" kinda deal? Not 'hours', though admittedly with only six planets ATM, I imagine one probably only has Mark I Snipers. On the bright side, once they 'shrink' the shields down enough, they will have a bonus against the Polycrystal hulls on those Arachnid posts(not to mention the Bombers), which will remove that major threat to your Starships, and they won't have to do the whole job themselves. The problem is that virtually everything with 'Guard Post' in the name has Radar Dampening, which will require any unit without Radar Dampening Immunity to get obnoxiously close to that mess in order to fire on them. Sniper(and Spider) Turrets are the only reliably-available RD-Immune units available to the player. Drone spawners(like say, Spire Blade Launchers) would be almost useful here, if not for the Gravitic Command Station, which slows them to a crawl, so their limited-lifetime 'projectile'-units would simply die before achieving anything. Beachhead it with Needler Turrets. They have an attack multiplier against those things. Then add some Sniper and Missile Turrets to cover the Needler Turrets. Also build some Remain Rebuilders and attack (X) move them close to the turrets. Or you can send a lot of empty (Assault?) Transports and 1 loaded with Raider Starships. The empty ones will be used to absorb the alpha strike from the AI Guardposts and ships. After the initial alpha strike you unload the one where you have the Raider Starships and PAUSE the game IMMEDITALEY after you have hit u to unload. Then you select the Raider Starships and destroy anything you want that is under the Force Fields and pause again. Now load the Raiders back into the Transport(s) if any are still alive and get back to safety. tried penetrator of hive golem yet?